Peg Howell, left, a leader in SODA, confronts state Sen. Stephen Goldfinch, center, about his position on offshore drilling. While permits to allow testing for oil and gas off the South Carolina coast are being challenged in federal court, opponents of offshore drilling are expecting a decision any day about the plans to open the Outer Continental Shelf. The sale of leases by the Bureau of Ocean Energy Management is proposed to start in 2020. It is possible the lease sales could start before the legal challenge to seismic testing permits is resolved, said Peg Howell, a leader in Stop Offshore Drilling in the Atlantic (SODA). “Would the companies drill without seismic?” she asked. That would be most likely off the North Carolina coast at Cape Hatteras, where limited drilling took place in the past, she said. Making the public aware of the process is part of the SODA mission, Howell said. Last year, the group rallied opponents to submit comments to BOEM on a “draft proposed program” for offshore oil and gas leases. The agency is now due to issue the proposed program. Gov. Henry McMaster and five of the seven House members from South Carolina oppose offshore drilling. It is possible all or part of the Atlantic Coast could be left out of the program. “It could just remove the 40 miles between the coast” and the first lease tract, Howell, a petroleum engineer who has worked on oil rigs, said. There will be a 90-day comment period on the proposed program. “We’re expecting to hear any day,” Howell said. the court to add the state to the lawsuit. The groups also got a boost when a federal judge enjoined BOEM from issuing permits for seismic tests while the Department of Justice was preparing to answer the suit. “That was huge,” said Amy Armstrong, executive director of the S.C. Environmental Law Project, which represents the municipalities. While Justice Department attorneys said their work was delayed by the federal government shutdown, BOEM recalled staff to process the permits. “We’re all doing a lot of work scrambling to extend the injuction,” Armstrong said. 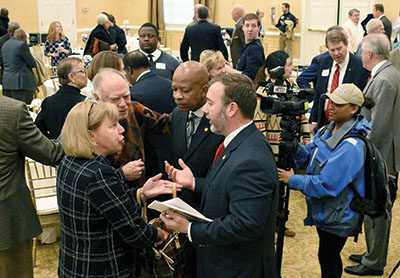 She confronted state Sen. Stephen Goldfinch after a legislative breakfast last week in which he told the audience he supports testing and drilling for gas, but not oil. “Nobody in their right mind is saying drill for oil,” he said. But Howell said “you can’t explore just for natural gas.” And wells typically produce both. Under federal law, oil must be extracted first. Goldfinch said BOEM figures show little oil but plentiful gas off South Carolina. “Perhaps Sen. Goldfinch is confused,” Howell said. A BOEM map she gave him shows .41 billion barrels of oil and 1.8 trillion cubic feet of gas. But when the gas is converted to barrels, it equals .32 billion.